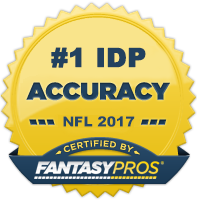 Hello and welcome to the third and final part of a series covering IDP average draft positions (ADPs). This article will compare the ADP of Defensive Backs (provided by My Fantasy League) to my Redraft Rankings for Defensive Backs. Keep in mind that the ADP of cornerbacks and rookies may be slightly inflated due to the incorporation of CB-required and rookie-only IDP drafts into MFL's overall draft position numbers. SS Dawan Landry (JAX) - It's hard to understand why Landry is being so undervalued. He's finished as a top 25 defensive back in two consecutive seasons and is still in the outer prime of his career. The Jaguars are likely to struggle again this year on offense which will provide Landry with a good amount of tackle opportunity. At a position with much year-to-year volatility, he should be a fairly safe bet for top 30 production. LCB Antoine Winfield (MIN) - Winfield's stock has dropped severely over the last couple of seasons as he's struggled to stay healthy and, at age 35, is in the twilight of his career. The fact remains however that, when healthy, he's a top 3 tackle producer at the cornerback position. He's still the Vikings best all-around cornerback and has reportedly looked "spry" and had "a bounce in his step" during OTAs. He's well worth a roster spot at his current ADP, especially in CB-required leagues. If he can make it through the majority of the season unscathed, don't be surprised if he puts up DB2 numbers. FS Kerry Rhodes (ARI) - IDP owners have short memories. It was just two seasons ago when Rhodes was a top 5 fantasy DB in the majority of scoring systems. His 2011 season was basically all for naught after missing after half the season due to injury. Although, his chances of replicating his 2010 numbers are slim, he's still capable of 80+ total tackles and a healthy amount of big plays in Defensive Coordinator Ray Horton's aggressive scheme. If you are nearing the end of your draft and looking to fill your DB4/5 spot, Rhodes is as good a choice as any. RCB Alterraun Verner (TEN) - Verner has quickly emerged as one of my top IDP sleeper picks of this season. The Titans cornerbacks have put up great fantasy numbers over the last handful of seasons and Verner displayed CB1 potential back in his 2010 rookie season where he posted 85 solo tackles while filling in for an injured Jason McCourty. Verner will take over Cortland Finnegan's old RCB role on base downs and slide into the slot in nickel packages. Expect CB1- numbers from him this year. SS Yeremiah Bell (NYJ) - I'll admit that I may be a bit high on Bell, but when you look at the players being drafted around him (e.g. Charlie Peprah who was recently cut by the Packers), he's got more upside than most. He's not going to put up the type of numbers he did during his fantasy heydays in Miami, but there's a good chance LaRon Landry misses significant time at some point this season which will open the door for Bell to have free reign in the secondary on a team with little competition for tackles. RCB Patrick Peterson (ARI) - Peterson's DB3 ADP is completely understandable and appropriate for those in leagues that reward heavily for IDP return yardage as he was the #1 DB in a majority of those scoring systems. However, in typical IDP leagues, this draft position is WAY TOO HIGH. Peterson is quickly turning into a very solid all-around cornerback and teams will begin throwing the ball away from him. Even in his rookie season where teams threw at him a good amount, he only had 64 total tackles and 2 INTs. In summation, in return leagues Peterson is a top 5 defensive back selection. In all other IDP scoring systems, he's a DB4 at most. FS Ed Reed (BAL) - Reed seems to make this list year in and year out. He's just not a player I feel all that comfortable having on my team. He hasn't registered more than 44 solo tackles in over 5 years (career high is only 67 back in his 2002 rookie season) and he's missed a substantial amount of games over the last three seasons. When healthy, he's undoubtedly one of the best ballhawks in the game, but he just doesn't do enough outside of that to take a chance on him as a top 35 selection. I usually just ignore him completely and let some other IDP name chaser draft him. LCB Joe Haden (CLE), LCB Darrelle Revis (NYJ), and LCB Nnamdi Asomugha (PHI) - Haden, Revis, and Asomugha are all shutdown corners with the ability to shadow the majority of the NFL's best wideouts. However, unlike on the offensive side of the ball, extraordinary on-the-field skill and talent doesn't always translate into superb fantasy numbers. In fact, it's usually detrimental to to fantasy production. None of these players should be taken in the top 40 let along the top 25. Their inflated ADPs are a direct symptom of novice IDP owners drafting cornerbacks based off of the faulty assumption that skill translates to fantasy production. Leave these guys on the waiver wire. LCB Morris Claiborne (DAL) - Claiborne's ADP is likely inflated a bit due to the incorporation of rookie drafts and CB-required leagues into the My Fantasy League's ADP results, nonetheless he's still being drafted too high. He's quite comparable to his former teammate Patrick Peterson (mentioned above) in that he's extremely quick and athletic and the potential to make several game changing plays throughout the season. However, his role within Dallas' scheme will not be conducive to great fantasy numbers, particularly great tackle numbers. He's not likely to be a factor much in the return game, so owners shouldn't be drafting him based on that either.